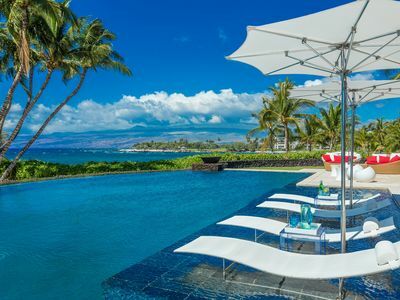 Welcome to Home of the Milky Way, Hale Lalani Hoku, a part of our Hawaiian Luxury Collection. 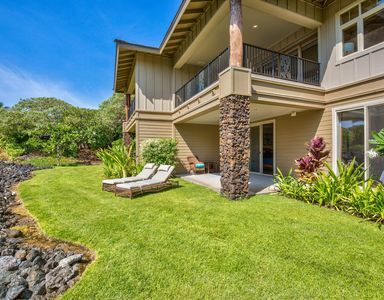 Home of the Milky Way is a new and wonderful 3-bedroom home on Kohala Ranch. 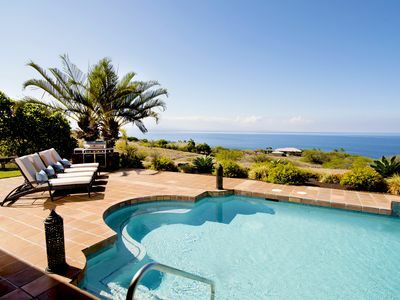 It has some of the most amazing views of the Pacific Ocean and coast line of any vacation rental on the Big Island. 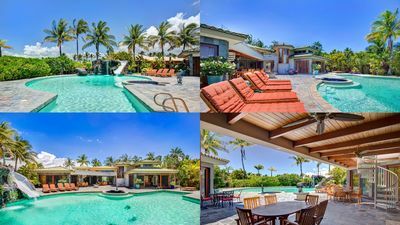 This fabulous astronomy-themed vacation rental home is minutes from resort areas with some of the finest beaches, snorkeling, diving, deep-sea fishing and golfing in the world. 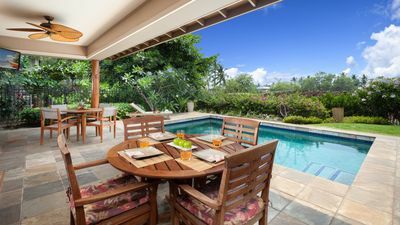 We pride ourselves on providing some of the most sought after homes on the Big Island of Hawaii, and our guest reviews on our other homes give you a sense of our focus on customer service, and how our goal is to ensure our guests have the finest vacations possible. We have now partnered with the wonderful homeowners of Home of the Milky Way to provide a very similarly well-equipped home for your entire family or group to enjoy. 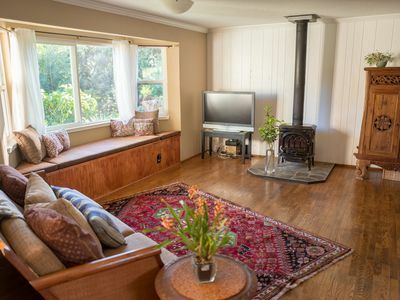 Home of the Milky Way, Hale Lalani Hoku, on Kohala Ranch provides a perfect setting for your private Big Island getaway and is designed for groups of up to 6 people in 3 separate bedrooms. 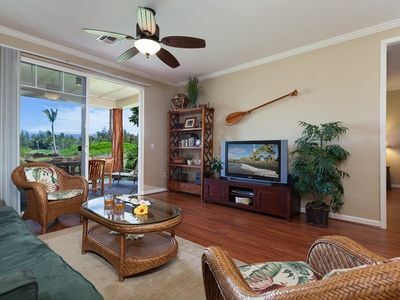 Home of the Milky Way is an inviting, relaxing, scenic and luxurious astronomy themed home for your Hawaiian vacation. 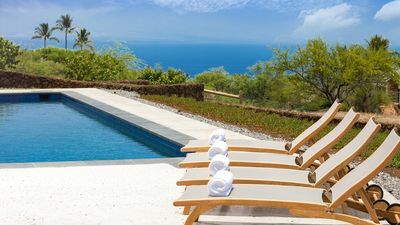 This extraordinary new resort-style home is located at 560' elevation on Kohala Mountain overlooking undeveloped state land with wide expansive views of the ocean. Four other volcanos can also be seen from this location: Mauna Kea, Mauna Loa, Hualalai and Haleakala (on Maui). When the horizon is extremely clear, you can also see the island of Lana'i. We invite you to experience astronomy heaven between the observatories of Mauna Kea to the southeast and Haleakala to the northwest. 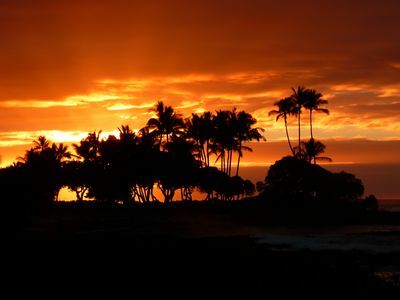 The Big Island is such a spectacular place to spend with your friends and family, children and grandchildren. Vacations create such wonderful memories; our hope is this trip will be one of your fondest family memories and that you'll return year after year. This 3-bedroom home is fully furnished with (2) Master Suites, with ensuite bathrooms featuring plant-filled outdoor showers. 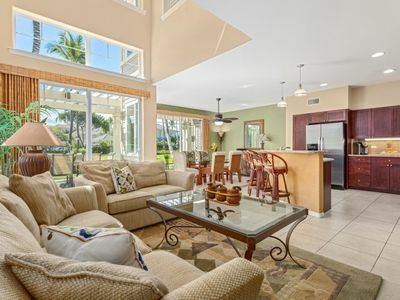 Bedrooms open to the lanai and have California King beds. One of these bedrooms features a built-in desk/vanity so that you can easily keep in touch with your office or family. Wake up in the morning to amazing ocean views from either room. Third bedroom features two twin beds that can be combined into a King with a gel topper. It also has a built-in vanity/desk. This room also features ocean and mountain views. The airy, open concept main floor includes kitchen, dining area, great room. 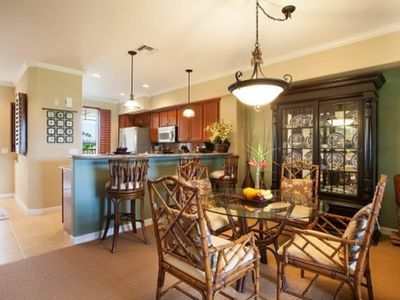 Gourmet kitchen with a breakfast island that seats 6, lots of counter space, new appliances and cookware. 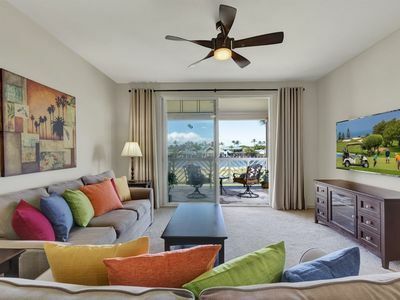 Great room with comfortable seating, 24' pocket door that opens to the lanai and a 65” UHD flat screen TV, DVD/BluRay player, complimentary Netflix or Apple TV. Perfect for relaxing, playing games, listening to music on the sound-bar, watching the game, or movie night with the family. 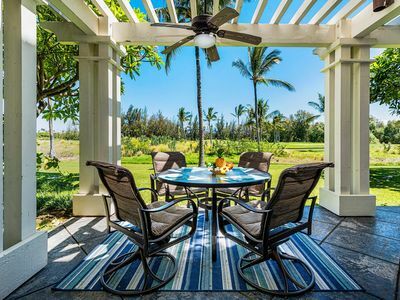 Outdoor living at its best, the expansive covered lanai has ample space for outdoor dining and relaxing. Steps to your private 12'x40' Salt-water pool, heated by solar panels. No chlorine! The salinity is very gentle, the same as your eyes. 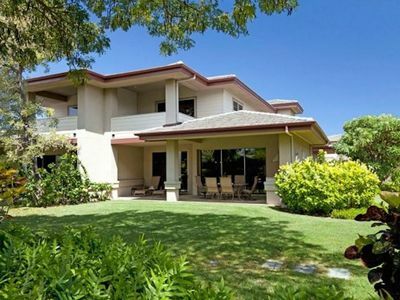 Whether you're celebrating a birthday, anniversary, a new job, retirement, or simply celebrating the sunshine, this home is sure to have you fall in love with the Big Island. Beyond building an elegant, yet comfortably furnished home, we know it's often the small surprises and conveniences that make all the difference. • Large binoculars to watch the whales (winter), fishing boats and the barges with their tug boats. • Astronomy books and charts. • Comfortable beach chairs and umbrellas, pool and sand toys and more. There's no chance of running out of things to do on the Big Island ! Here's a small sample. 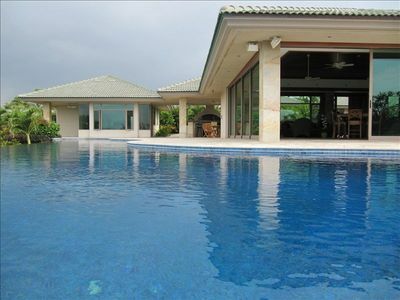 Check out Paradise in Hawaii Luxury Homes website for even more great idea's on things to do while on the Big Island. The 12'x22' roll-off observatory will be available only to guests who have experience with Astro-Physics equipment or it can be booked with a local astronomer who will give you a private tour of the night sky. Pre-approval is required and there will be additional fees to use the observatory. 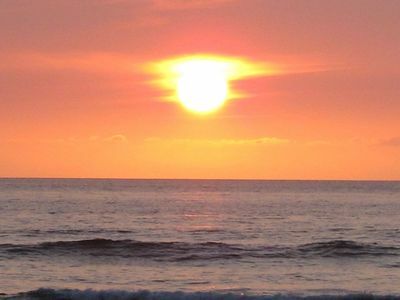 Since Hale Lalani Hoku is approximately 20 degrees north latitude, sunset times are similar in Summer and Winter. Astronomers who live in northern latitudes will enjoy longer nights viewing the summer Milky Way in Hawaii since the sun sets at 7:05 and twilight is short. Whale Watching: Each winter the Big Island is host to the incredible Humpback whales. Pour your coffee and grab the binoculars (provided) and look for whale spouts, breeches and fin slapping. 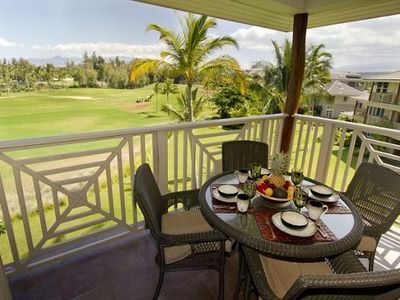 Golfing: Home to the PGA Mens' and Women's tours, there are incredible golf courses found all around the island. Visit our web page to find out more about golf on the Big Island. Volcano National Park: Take a day trip to the Volcano, walk through a lava tube, and in the evening you may even see the orange glow of Lava in the crater. Coffee Tours: Fresh Kona Coffee and Coffee tours. There is nothing in the world like Kona Coffee. Contact us today to book your stay at this spectacular home! 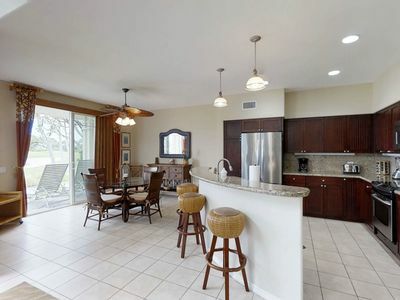 Luxury Townhome with Beach Access! 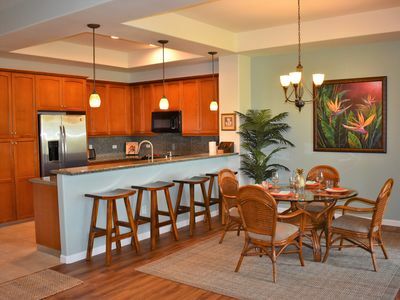 Waikoloa Beach Villas I3. 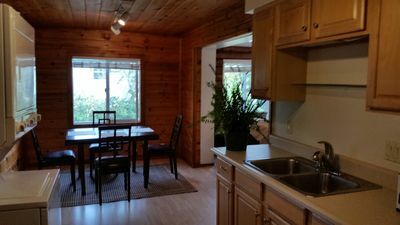 Beautiful 2 bedroom condo. Close to shops and restaurants.